The title for Teresa Christiansen’s current exhibit at Melanie Flood Projects, Indifferent Horizons, is taken from an early passage in Robert Smithson’s essay, “Incidents of Mirror-Travel in the Yucatan.” Smithson speaks paradoxically of a horizon that is “closed in its openness,” always moving yet static, out of our grasp yet right below us. His hyper-attentive meditation on physical space functions as a way to displace himself for the making of art. While only two of Christiansen’s photographs and photo-based images contain a quasi-apparent (and therefore if not indifferent, then problematic) horizon line, this is not necessarily a sticking point. As Smithson would suggest, “Contrary to affirmations of nature, art is inclined to semblances and masks, it flourishes on discrepancies.” We can, however, find a comprehensive understanding of Christiansen’s works by virtue of their content, and then place them in the tradition of landscape. In contemporary landscape, the need for the horizon has been deprioritized, as well as other liberties taken regarding the how and what of representation, all to address less direct “depths” of the natural world. Because Christiansen has not limited herself to the standard presentation of flat, 2D prints, her manipulations also align with other art genres, namely sculpture, and collage, and certainly recall painting. But make no mistake, the eight pieces exhibited in the gallery are very clearly about and of the photographic tradition. 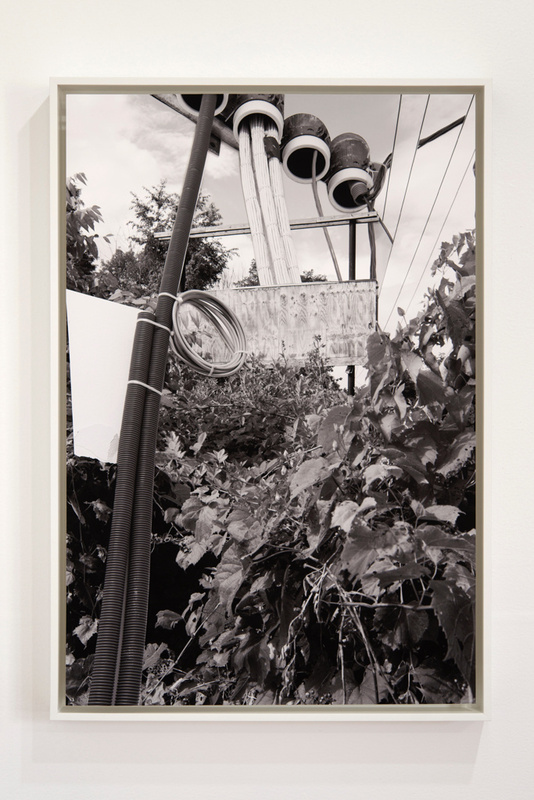 Still, her piece “Monument” is more collage than photograph, or rather, is an interwoven amalgam of various, torn, black and white photos, and is a good representation of having one foot in photography and another in another medium. Her fragments of prints are strong in content, layered and interwoven to create a formal structure reminiscent of cubist or abstract painting. Yet it is the skilled placement of these torn scraps that make this piece an uncannily idealized (and therefore impossible) landscape. Moreover, it is brought about in a very old-school, cut-and-paste manner. It is known that Christiansen mostly shoots film. What she has done for Indifferent Horizons is push that analog envelope. For instance, for her piece, “Dedifferentiation” some of the photo fragments are lifted an inch or two away from the surface. And while none of this is a new direction in use of material, it lends itself to Christiansen’s overall theme for this exhibit—to examine (less “break away from”) the restricting, often unforgiving visual flatness of photographs. If humans were cyclopes, and therefore lacking stereopsis, photography might not leave us so wanting. After all, depth perception created the need for the stereoscope, 3D movies and lenticular prints, illusions all. Christensen seems to make a nod to the latter of these devices with “Shadowed Disconnection,” which depicts a thicket of fir limbs with a little bit of blue sky poking through. 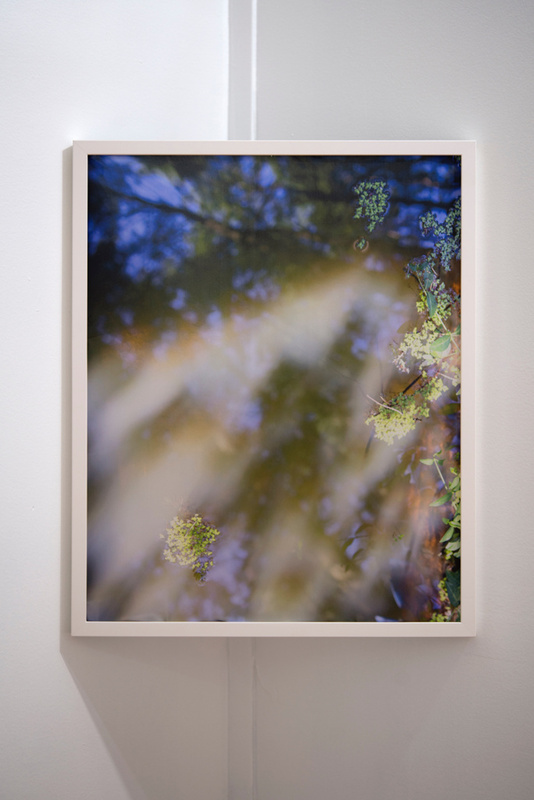 The shallow-focus print is mounted behind frosted plexiglass, but more than this, the print is bent and folded so that some parts of it come right up against the plexi. Frosted glass most effectively obscures when what lies behind it is further away from the glass. The creased parts of the print closest to the glass look like they could break through the glass, while effectively making the rest of the print look farther into the distance than it actually is. The piece looks so much like a lenticular print that one moves side to side to see if the image changes. Not that we would be immediately aware of its import, but this movement by the viewer, the shifting from side to side, has the effect of putting us in a more dynamic relationship with the extended landscape, that is, the space in which we exist with the image. Once realized, we are able to have a deeper appreciation for the thought that has gone into this exhibit, from the work that is presented to the way it has been hung. It seems Robert Smithson has made a resurgence of late, especially his writing. In “Incidents of Mirror-Travel in the Yucatan,” Smithson adopts the style of a mystic as much as a philosopher of aesthetics (“sight turned away from its own looking”), so the appeal is understandable. However, it has also spawned so many in-his-image, literal homages that they overlook his diligent preference for a “productive apathy.” Not so with Teresa Christiansen. 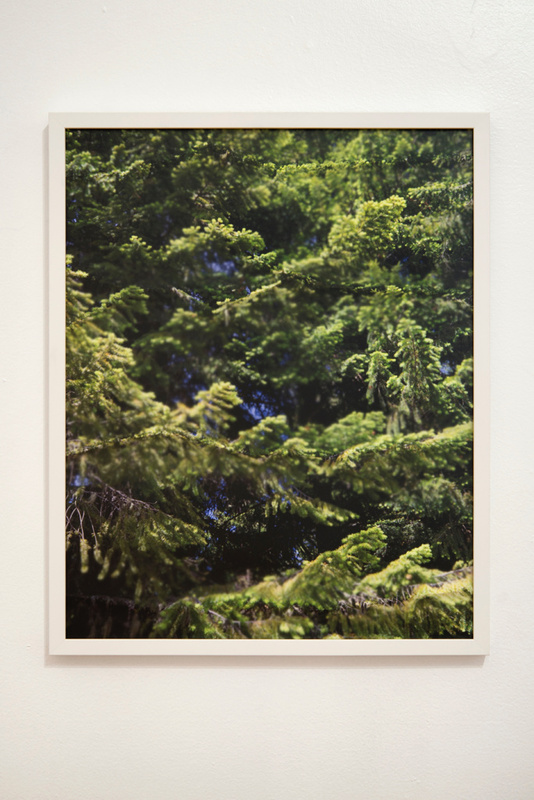 Teresa Christiansen’s Indifferent Horizons continues through May 15 at Melanie Flood Projects, 420 SW Washington St #301.